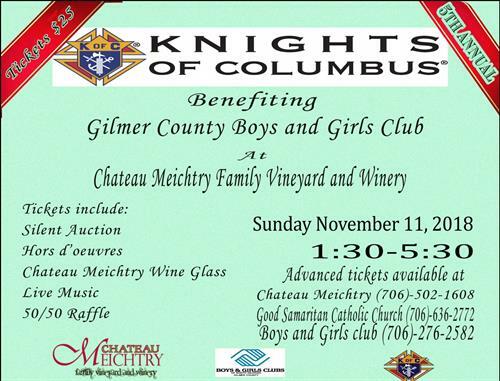 Knights of Columbus benefiting Gilmer County Boys and Girls Club at Chateau Meichtry Family Vineyard and Winery. Tickets include: Silent Auction, Hors d'oeuvres, Chateau Meichtry wine glass, live music and a 50/50 raffle. Advance Tickets for sale at Chateau Meichtry 706-502-1608, Good Samaritan Catholic Church 706-636-2772, Boys and Girls Club 706-276-2582.